You can connect your TrainingPeaks account to Zwift so that workouts completed in Zwift automatically sync to TrainingPeak and Structured workouts from TrainingPeaks automatically sync to Zwift each day. To connect Zwift to TrainingPeaks login to zwift.com and make sure your account is linked on the connections page. If you connected them already several years ago or your structured workouts aren't syncing then try disconnecting and reconnecting your accounts. 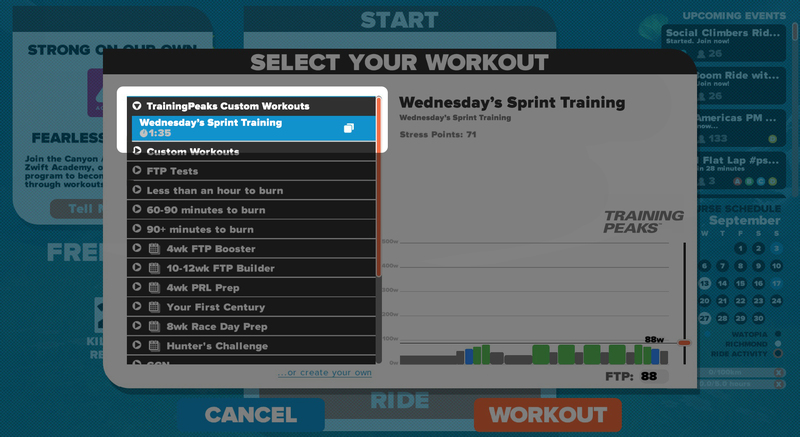 When you login to Zwift and select workouts, you will find today's workout under the TrainingPeaks dropdown (if you don't see it at the top scroll down to the bottom as sometimes it will be last in the list of workout folders). You'll only see the workout for the current day, and it updates automatically each day. If you want to save a workout permanently to you Zwift workout folder so you can use it anytime then you can manually add the workout file to Zwift. More information about Zwift and TrainingPeaks can be found here.